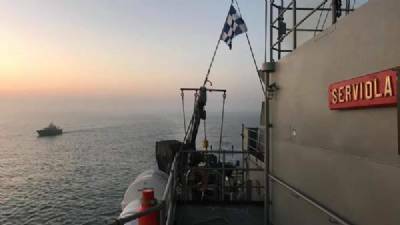 The P-71 Serviola is based on the west African coast and was carrying out security operations on Tuesday when its crew located the ship, which was navigating "erratically" and without transmitting via the Automatic Identification System (AIS). Spanish Naval officials radioed the ship"s crew, who confirmed they had been hijacked four days ago. The pirates had moved away when they saw the Spanish Navy craft approach, although it was likely they would return once the coast was clear (See video below). According to the Nigerian Captain, no one of the 12 Nigerian crew on board the merchant ship had been harmed during the four days they had been under siege. Nine pirates, armed with AK-47 rifles and grenade launchers, stole money, valuables and much of the food found on the ship over the days the vessel was held. The Serviola remained present long enough for the vessel to leave the Gulf of Guinea and continue on its course, out of the reach of the pirates. The sSpanish ailors gave provisions to the crew of the ship and continued with the patrol, while the hijacked ship headed for Lagos, according to the statement sent by the Navy.